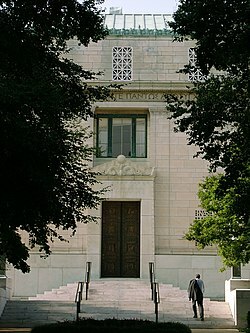 The National Academy of Sciences building in Washington, D.C..
As a national academy, new members of the organization are elected annually by current members, based on their distinguished and continuing achievements in original research. Election to the National Academy is one of the highest honors in the scientific field. Members serve pro bono as "advisers to the nation" on science, engineering, and medicine. The group holds a congressional charter under Title 36 of the United States Code. As of 2016[update], the National Academy of Sciences includes about 2,350 members and 450 foreign associates. It employed about 1,100 staff in 2005. The current members annually elect new members for life. Up to 84 members who are US citizens are elected every year; up to 21 foreign citizens may be elected as foreign associates annually. Approximately 190 members have won a Nobel Prize. By its own admission in 1989, the addition of women to the Academy "continues at a dismal trickle", at which time there were 1,516 male members and 57 female members. The National Academy of Sciences is a member of the International Council for Science (ICSU). The ICSU Advisory Committee, which is in the Research Council's Office of International Affairs, facilitates participation of members in international scientific unions and serves as a liaison for U.S. national committees for individual scientific unions. Although there is no formal relationship with state and local academies of science, there often is informal dialogue. The National Academy is governed by a 17-member Council, made up of five officers (president, vice president, home secretary, foreign secretary, and treasurer) and 12 Councilors, all of whom are elected from among the Academy membership. About 85 percent of funding comes from the federal government through contracts and grants from agencies and 15 percent from state governments, private foundations, industrial organizations, and funds provided by the Academies member organizations. The Council has the ability ad-hoc to delegate certain tasks to committees. For example, the Committee on Animal Nutrition has produced a series of Nutrient requirements of domestic animals reports since at least 1944, each one being initiated by a different sub-committee of experts in the field for example on dairy cattle. From 2004 to 2017, the National Academy of Sciences administered the Marian Koshland Science Museum to provide public exhibits and programming related to its policy work. The museum's exhibits focused on climate change and infectious disease. In 2017 the museum closed and made way for a new science outreach program called LabX. Albert Einstein Memorial outside of the National Academy of Sciences building in Washington, D.C. The National Academy of Sciences Building is located at 2101 Constitution Avenue, in northwest Washington, D.C.; it sits on the National Mall, adjacent to the Marriner S. Eccles Federal Reserve Board Building and in front of the headquarters of the U.S. State Department. The building has a neoclassical architectural style and was built by architect Bertram Grosvenor Goodhue. The building was dedicated in 1924 and is listed on the National Register of Historic Places. Goodhue engaged a team of artists and architectural sculptors including Albert Herter, Lee Lawrie, and Hildreth Meiere to design interior embellishments celebrating the history and significance of science. The building is used for lectures, symposia, exhibitions, and concerts, in addition to annual meetings of the NAS, NAE, and NAM. The 2012 Presidential Award for Math and Science Teaching ceremony was held here on March 5, 2014. Approximately 150 staff members work at the NAS Building. In June 2012, it reopened to visitors after a major two-year restoration project which restored and improved the building's historic spaces, increased accessibility, and brought the building's aging infrastructure and facilities up to date. More than 1,000 National Academies staff members work at The Keck Center of the National Academies at 500 Fifth Street in northwest Washington, D.C. The Keck Center provides meeting space and houses the National Academies Press Bookstore. The Marian Koshland Science Museum of the National Academy of Sciences – formerly located at 525 E St., N.W. – hosted visits from the public, school field trips, traveling exhibits, and permanent science exhibits. ^ "Overview: NAS Mission". National Academies of Science. Retrieved 25 April 2015. ^ a b "About NAS: Membership". National Academy of Sciences. 2013. ^ Alberts, Bruce (2005). "Summing Up: Creating a Scientific Temper for the World" (PDF). National Academy of Sciences. ^ http://www.nasonline.org, National Academy of Sciences -. "Overview: Membership". www.nasonline.org. Retrieved 2018-04-02. ^ "News of the week from the science world". Journals. San Francisco Examiner. May 20, 1989. p. D-2 – via Newspapers.com. ^ "Constitution". National Academy of Sciences. Retrieved 2014-07-20. ^ "Newsroom". National-Academies.org. 2011-06-02. Retrieved 2012-03-12. ^ National Academy of Sciences. "The NAS Building ... a Temple of Science". Archived from the original on 29 December 2010. Retrieved 12 October 2010. ^ "A Home for Science in America". www.nasonline.org. Retrieved 2015-07-27. ^ "Restoration of Historic National Academy of Sciences Building". CPNAS. National Academy of Sciences. 2013. Retrieved 12 August 2013. ^ a b National Academy of Sciences. "Visiting Our Buildings". Retrieved 12 October 2010. ^ "Marian Koshland Science Museum of the National Academy of Sciences". Retrieved 12 October 2010. ^ ITS. "Founding of the National Academy of Sciences". .nationalacademies.org. Retrieved 2012-03-12. ^ For an analysis of the motives by Alexander Dallas Bache for founding the NAS, see Jansen, Axel (2011). Alexander Dallas Bache: Building the American Nation through Science and Education in the Nineteenth Century. Campus. p. 285-314. ^ a b c d Miller, Lillian; Voss, Frederick; Hussey, Jeannette (1972). The Lazzaroni: science and scientists in mid-nineteenth-century America. Smithsonian Institution Press. p. 121. Retrieved 2007-10-26. ^ OCGA. "An Act to Incorporate the National Academy of Sciences". .nationalacademies.org. Retrieved 2012-03-12. ^ Neil deGrasse Tyson's Gettysburg Reply - "The Seedbed"
^ "Leadership and Governance". National Academy of Sciences. 2016. ^ "Statement on Global Response to Climate Change". The Royal Society. 2005-06-07. ^ Helderman, Rosalind (May 9, 2010). "U-Va. urged to fight Cuccinelli subpoena in probe of scientist". Washington Post. p. C5. ^ "Open letter: Climate change and the integrity of science". The Guardian. May 6, 2010. ^ "Curriculum Vitae: Michael E. Mann". psu dot edu. Retrieved July 5, 2013. ^ Foley, Henry C.; Alan W. Scaroni; Candice A. Yekel (3 February 2010). "RA-10 Inquiry Report: Concerning the Allegations of Research Misconduct Against Dr. Michael E. Mann, Department of Meteorology, College of Earth and Mineral Sciences, The Pennsylvania State University" (PDF). The Pennsylvania State University. Archived from the original (PDF) on 15 February 2010. Retrieved 7 February 2010. ^ a b c "Membership FAQ". NAS.